Moisture Vapor Blocker - How to reduce moisture transmission in concrete floors. moisture vapor transmission in concrete floors and slabs. A moisture vapor blocker is a type of concrete sealer. The difference between a moisture blocking sealer and a regular concrete sealer is moisture vapor blockers deeply penetrate the capillary structure of the hardened concrete. Basically, the sealer fills all the pores, solidifying the inner matrix of the concrete, blocking any path moisture vapor would take to escape to the surface. If a concrete vapor barrier was correctly installed before the concrete floor was poured, there wouldn't be a need to block moisture from the surface of the concrete. The moisture would have been cut off at the source, the sub-base. When a vapor barrier isn't used under the concrete, the next best solution is to waterproof the concrete from the top, taking advantage of the porous sponge-like inner matrix of the concrete. Moisture vapor blockers are designed to migrate deep into the concrete substrate and form a hygroscopic and hydrophilic crystalline material that permanently block the pores in the concrete. The crystallization of the moisture blocker continues to fill and block the capillaries in the concrete even under constant hydrostatic pressure. Why is it important to prevent moisture vapor transmission in concrete floors? 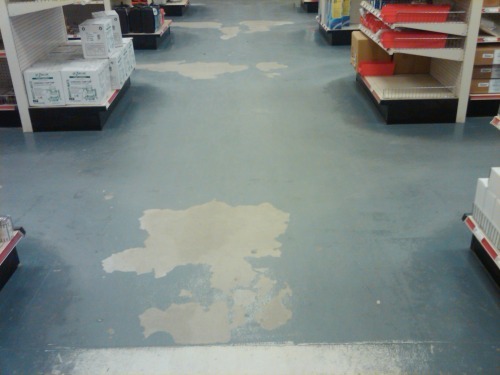 When moisture vapor escapes through the surface of the concrete it can cause a lot of problems for flooring materials that won't let the concrete breathe. Flooring materials like epoxy, linoleum, glued on laminate, and wood can seal the surface causing moisture pressures to build up in the concrete. When the pressure increases to a certain point, usually more than 3lbs per 1000 square feet in 24 hours, these flooring materials can lift, peel, blister, and buckle. If you're thinking of applying a flooring material to your concrete floor, it's a good idea to test the concrete for moisture even if the surface looks dry. Moisture could be evaporating as soon as it reaches the surface and not be noticeable. A simple calcium chloride test can be done to determine the rate at which moisture vapor escapes the surface of concrete floors and slabs. Most flooring manufactures recommend moisture vapor transmission from a concrete floor be below a certain rate before their flooring materials are installed. What can I use to block moisture vapor in my concrete floor? You can also use RadonSeal sealer for sealing basement walls, basement floors, slab-on-grade foundations, crawlspaces, garage floors, driveways, warehouse floors, and parking areas. This sealer is water-based so it doesn't leave a film on the surface. It's slip-resistant and paintable, has zero VOCs, and comes with a money-back Lifetime Guarantee! If you're thinking of having a coating or flooring material applied to your concrete floor or slab, ask the contractor to test the concrete for moisture vapor transmission. It's quite easy and inexpensive to do, it might also save you from having problems down the road. If the reading comes in higher than the coating is rated for, use a moisture-vapor blocker and test the concrete again. Better to be safe than sorry! Checking and dealing with these issues first would be a good place to start.